Last year ended with a hike up to the Bendora arboretum in the Brindabella mountains that frame Canberra. As the sun went down, the excursion was a relatively cool and calm way to see out a 2016 that had a few rough edges. This year I’m pleased to say has been smoother sailing. Our major improvement to our home this year was to replace all our aged windows and draughty sliding doors with new double glazed windows. We paid a lot for high quality German engineered doors and windows which are extremely solid and of high quality. Of course, given our location the installation was a challenge, and required the destruction of parts of our garden to get a machine in to lift and move the windows. Unfortunately due to a manufacturing error - we had to wait until September to have the final sliding door fitted and the installation complete. This year I joined the Executive Committee that represents the Owners Corporation for Wybalena Grove. This has been a good experience so far, building networks with members and residents of the Grove, dealing with a wide range of issues coming up for discussion and decisions (including some curly situations that threaten legal action) and the perenial ‘difficult’ residents to manage. We sadly bid farewell to our little compnion Roger in November. He arrived in our life about 12 years ago as a rescue dog from the pound, and lived to a good old age of about 17. For the past couple of years the old man had got increasingly frail and unaware of his surroundings. He was costing us a fortune in absorbent towel, not to mention the disturbed nights sleep. The decision came quickly after he turned off his food and was ill over a weekend. On that Monday afternoon we took him in for his final vet visit, and a few days later had a well sealed box of his cremated remains. Farewell Roger and thanks for being part of our family. I set myself a goal of increasing my yearly mileage from just over 2000km in 2016 to over 2500 this year. That was going to require a pretty consistant 50+ km / week. As you can see below I’ve hit my target with a very consistant year. The one glitch to my otherwise injury free year occured a few weeks ago when I tripped onto a sharp pointed rock that punctured my knee. No lasting injury - but with a lot of bruising and a single stitch on my kneecap it laid me low for a good few weeks. I only entered two big events this year. I would have liked to have capped off the year with another Deep Space Mt marathon run - but my bruised knee ruled that out. What I lacked in quantity however I sure made up for in quality - with two superb runs in amazing locations. 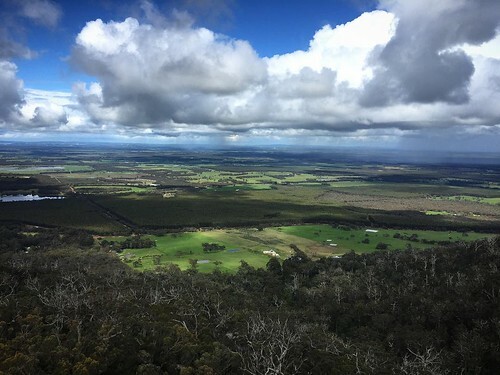 Mt Solitary 45k had a false start this year - with the remains of the tropical cyclone leaving too much rain and danger across NSW. The race was rescheduled for July and David and I returned to the Blue Mountains to run it out. You can read my race report here. The highlight of the year however would have to be the multi-day stage race, Run Larapinta. This was 130km over 4 days across the spectacular Larapinta trail in the West McDonald ranges outside of Alice Springs. Travelling on my own, and exploring central Australia was a real treat. Unfortunately having unseasonably-searing-heat in late August, with averages of 31 degrees, made it a far bigger challenge - and one that I’m keen to return to. My race report for Run Larapinta is here. Next year I have a goal to run more +50k runs, starting with the 65K Razorback run in mid March, and all being well followed by UTA100 in May! As always the main aim is to maintain consistancy and the pleasure of running, exploring new places with great views, and meeting great people out on the trails. Denise and I took the opportunity in March to sneak away for a short city break to Singapore. It was my first time over there, and we stayed in the beautiful Hotel Fort Canning nestled amongst the green and relative cool Fort Canning park. This was a lovely break with some time spent running, relaxing with a good book by the pool and heading out for short excursions in the heat. Fortuitously our mate from Melbourne, Sandy, was visiting friends in Singapore over the same period - which meant we all headed out to the local coctail bars and restaurants to catch up. This year my work sent me to a few peer National Statistical Organisations to review their IT solutions that support the Census in their country. This meant I had some time in Washington DC, followed by Ottowa Canada, then Titchfield in the UK. Being in late July the days were long and the weather pretty good - until the UK at least! In late November myself and my boss travelled to Christchurch and Wellington in New Zealand to review the Stats NZ preparations for their Census in March. We then spent the next two weeks road-tripping north up as far north as Shark Bay and Hammelin Pools, before returning south down to the Stirling and Porongurup ranges, and via Margaret River back up to Perth. A really good mix of scenery, food, wine and company. This year we also got in a few trips up to the Tate Lodge in Guthega and down to our friends lovely holiday home in Lilli Pilli on the beautiful south coast. A steady stream of good books this year - including finally reading War and Peace on my kindle about a decade after receiving a hard copy version. I continued to refine my all-grain BiaB setup this year - purchasing a nice Ss brew kettle, a Ph meter and a 5l demijohn. I also developed a taste for the sour/funky beer styles. These styles can be challenging to create - often taking over a year to develop and requiring some advanced methods to blend and balance the flavours. I brewed my first batch using the simpler, kettle souring method - which used a lactobaccilus starter from natural yoghurt to innoculate the wort and sour it within 48 hours. Whilst not to everyone’s taste - this light beer is fresh and carries a nice tartness and blueberry hue and has been brilliant over summer. More sour beers to be created in my home brewery soon. Back in April I rebuilt this website using GitHub hosted pages, and the static site generator Jekyll. So much simpler than a traditional wCMS for such a simple purpose. I wanted to use this as the impetus to blog more, and whilst not proficient I certainly have posted more this year than any other. We’ve now effectively ditched the old home theatre PC setup in favour of a single Chromecast. So much simpler to stream everything, including ‘live’ TV (when we occassionaly watch it). Works a treat using any iDevice or computer to cast to the TV. We continue to use NordVPN for security and cough geo-blocking reasons, and it continues to work pretty well despite Netflix playing whack-a-mole with the IP ranges they use every now and again. I found myself subject to the recent Apple CPU throttling on my old iPhone 6plus which was starting to drive me nuts. I also cracked my phone screen during our WA holiday. It was only when the screen went on the fritz properly and wouldn’t work at all that I decided to fork out for the new iPhone X. Again another well engineered phone, brilliant camera and screen, and the face ID works really well. To close out the year - a new Suunto sports watch that I’d been eyeing off showed up online for 40% off. Denise kindly offered to buy it for my Xmas present. So hopefully next week I’ll have the Suunto Spartan with wrist HR monitor on my arm during all my runs. So that was a flavour of 2017. Denise and I feel a bit more like free-agents despite frequently seeing shadows of Roger. We think 2018 will involve a few small holidays, starting with a trip back to the UK to see the Maddens. However 2019 is shaping up as a year of travel and adventures as we think we might avail ourselves of our long service leave and spend some time OS. I don’t make new years resolutions - but in 2018 I hope to run over 3000km including my first 100km ultra run. Natural, tart/funky on skin fermented wines. Do yourself a favour and check out Brave New Wines wines. Rabbit running gear - made in the US and good quality. The Out-Laws was a highlight of the years TV viewing - a superb dark comedy from Belgium. The latest Fargo series a close second.